So, I've been dying for a simple, quick yet trendy nail looks to try this fall but i couldnt seem to find one i loved... till NOW! 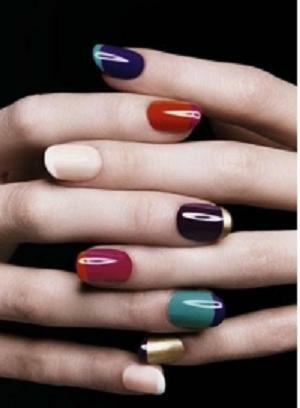 These multi-coloured nail tips add personality and drama to the nails. TIP: Use tape and create an outline of the tip of the nail. paint above the tape and when its dry peel it off. This will give you a defined and even line! Aw thank you Cami :) Yes i will definitely check out your blog!